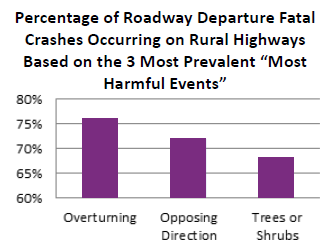 Each year roadway departure crashes account for more than half of United States highway fatalities and involve a vehicle that crosses an edge line, center line, or otherwise leaves the traveled way.1 A majority of these fatalities pertained to three general areas : overturning, opposing direction, and trees or shrubs. Roadway departure is a significant concern for rural roadways, and is predominantly due to the same three areas for all roadways as shown in the figure on this page. The purpose of this document is to describe the significance of roadway departure crashes on local and rural roads, to outline the nature of the problem, and to suggest potential treatments. Additional resources are also cited so local and rural road owners can learn more about overcoming the challenge of reducing roadway departure crashes. Keep vehicles on the roadway and in their travel lane. Strategies include rumble strips, signing, delineation, and high friction surface treatments. Reduce the potential for severe crashes when vehicles do leave the roadway or cross into opposing traffic lanes. Strategies include shoulder installation; widen the separation between opposing direction lanes, removing fixed objects, and slope flattening. Minimize the severity of a roadway departure crash if it occurs. Strategies include breakaway supports, traversable drainage grates, barriers such as guard rail (or guide rail), and end treatments. In most cases, lower-cost, highly-effective solutions are available at the top of the hierarchy. For example, warning sign installation has proven to have a significant effect on the reduction of curve-related crashes. It is important to note that some treatments are less likely to prevent crashes. For example, guard rail can reduce the severity of a roadway departure crash when it occurs, but it does not prevent the crash event. When considering the cost of a treatment, it is important to remember that the agency will need to maintain the countermeasure, and this can vary significantly between the various treatments. There are typically three implementation approaches to consider in reducing roadway departure crashes: the systemic approach, the spot location approach, and the comprehensive approach.2 These approaches may be done alone or in combination with each other. A systemic approach is focused on installing crash reduction countermeasures over a wide range or number of sites that share a high risk factor. Examples of risk factors could be lane width, speed, traffic volume, horizontal curvature, or traffic control devices. An agency can develop a list of risk factors through an analysis of the crash reports for their area. This approach is not limited by finding the exact location of crashes, because the approach considers multiple locations with the same risk factors. Countermeasures are selected that can be deployed among all locations that share specific risk factors. These countermeasures are typically low-cost and can be deployed easily. Although roadway departure crash locations are difficult to predict, the most common contributing factors to severe roadway departure crashes are predictable and consistent from year to year, so a systemic approach to safety mitigation can be quite effective. When addressing roadway departure crashes, the systemic approach typically includes the application of low-cost treatments along segments of roadway or entire routes. Basic traffic control such as signing and pavement markings in advance of and within curves. Centerline and edge line pavement marking to assist drivers to maintain their position within their lane. Selected fixed object removal (especially trees and utility poles) to reduce fixed object crashes. Another approach for reducing roadway departure crashes is focused on spot (site) locations. This approach is traditionally used to deal with locations that may not be addressed by a systemic approach. These locations may be characterized by a high number of crashes for a small length of roadway. In such cases, the analysis of the site drives the type of countermeasures that are implemented. This analysis could involve moderate to higher cost improvements as dictated by the conditions at the location. For example, poor pavement surface may cause ponding, leading to a high number of wet roadway-related crashes. Rehabilitating the pavement surface will correct the situation. In addition to infrastructure issues, the comprehensive approach addresses human factors issues such as speeding, impaired driving, distracted driving, and seatbelt use, all of which can contribute to roadway departure crashes. A large percentage of roadway departure crashes are speed-related, and reduced speed may have prevented the crash. Countermeasures to reduce excessive speeding or reduce the severity of the crash include speed enforcement and traffic calming measures. Impaired drivers have trouble navigating the roadway, especially around curves. Strategic enforcement that targets impaired driving coordinated with education and safety awareness efforts can reduce impaired driving. Similar to impaired drivers, distracted drivers have trouble navigating horizontal curves and can drift out of their lane when distracted (e.g., texting, cell phone use, radio, passenger distractions, drowsiness). Treatments include rumble strips and flashing beacons at curves combined with targeted enforcement. Seatbelts have been proven to save lives, yet the percentage of use—especially in rural areas—remains very low in some parts of the country. Education and enforcement can help increase seatbelt use, which in turn can reduce the severity of crashes when they occur. 1 Federal Highway Administration, Roadway Departure Strategic Plan (Washington, DC: March 2013).